Out among the stars, toward the constellation Capricornus, a red sphere floats freely through space. It doesn’t have enough mass to fuse atoms for fuel, as stars do, and it’s too small to be a failed star. In nearly every way, this drifter, known as PSO J318.5-22, is like a planet. Except it fails one key test for planethood: It does not orbit a star. PSO J318.5-22 is homeless. With no parent star to give it heat or light, it drifts in eternal darkness, a rogue of the Milky Way. Computer simulations in the 1970s gave planetary scientists their first hints that rogue planets might exist. As planets formed around a star, some planetary material would have been scattered into far-flung orbits. A few miniplanets may have been tossed far enough to be ejected completely from the star’s gravitational grasp. Later estimates suggested that every planetary system in the galaxy booted at least one planet into interstellar space. With billions of planetary systems in the Milky Way, there may be billions, maybe even hundreds of billions, of rogue planets in the galaxy, says planetary scientist Sara Seager of MIT. The first actual observations of what appeared to be free-floating planets came in 2000, suggesting that the simulations were on to something. In the last 15 years, astronomers have stumbled upon about 50 of these planetlike worlds. Some have all the characteristics of planets, minus a parent star. Others raise questions about how stars and planets can form. They all appear to challenge the standard definition of a planet. It’s time to go beyond serendipitous discoveries, says Michael Liu of the University of Hawaii in Honolulu. He would like to see a systematic search for other untethered worlds. Liu and his colleagues first spotted PSO J318.5-22 in 2010; they confirmed and reported the finding in 2013 (SN Online: 10/9/13). The researchers detected the planet in images taken with the Maui-based Pan-STARRS 1 telescope. 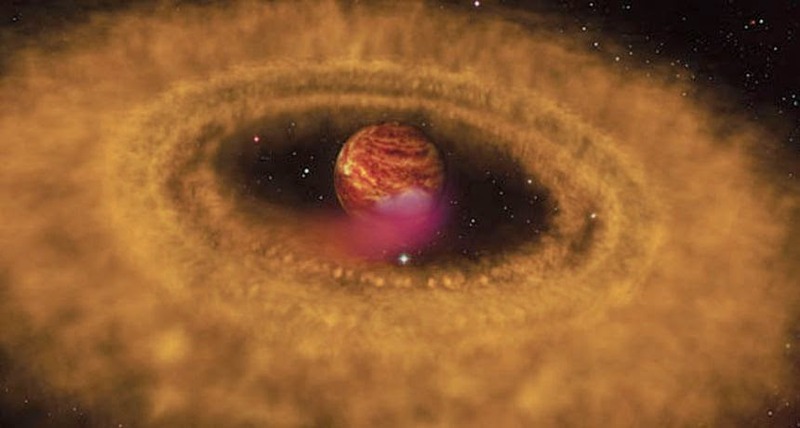 The team had been looking for failed stars called brown dwarfs, which appear to start their lives in the same way stars do: A clump of gas breaks free from a cloud of cold, dense gas and collapses, pulling material inward into a swirling disk around it. At the center of this disk is a baby star or, depending on the size of the original gas clump, a brown dwarf. Two traits distinguish a star from a brown dwarf and to an extent, from a planet: mass and the presence or absence of nuclear fusion. Stars, even small ones, are at least 80 times the mass of Jupiter, which at 318 times the mass of Earth is the most massive planet in the solar system — and is often used by astronomers to gauge the size of other gaseous objects. According to theoretical calculations about how stars work, objects must be 80 Jupiter masses or more to fuse hydrogen nuclei (protons) into helium. This process liberates energy, which is how stars burn bright, speckling the night sky. Brown dwarfs are smaller, anywhere between 13 and 80 Jupiter masses. They are not dense enough to fuse hydrogen. But they may have been big and hot enough to fuse deuterium nuclei (a proton plus a neutron) with protons or other nuclei, which means they once generated energy but no longer do. Any sphere less than about 13 Jupiter masses is not large or dense enough to fuse any kind of atomic nuclei. As a result, some astronomers define orbs with less than roughly 13 Jupiter masses — even untethered ones — as planets. y question is, is it possible for a planet to be solo in space not rotating around a star out in space, or do planets have to be locked in an orbit around its parent star... And the 2nd question is, is it possible for a star to form outside of a galaxy or can it form in the space in between say the Milky way and Andromeda? 1. It is possible but unlikely for a planet to escape a star due to gravitational interactions with other stars or large planets. It may also possible for a Jupiter-sized object to form in the same environment as larger stars, but this would be a gas giant, and not a rocky planet as you might be asking about. 2. Stars can and do form outside of galaxies, though this is usually in streams of matter that escape galaxies after two galaxies have a close interaction or merger. This is not a star forming in isolation that you might be asking about. Giant planets can form from gravitational collapse in a nebula much like brown dwarfs. Some of these free-floating planetary mass objects (planemos) have been found already, S Ori 68 (~5 MJ), S Ori 70 (~3 MJ), and Cha 110913-773444 (~8 MJ) being prototypical examples. Furthermore, because many extrasolar hot Jupiters have their orbital axes misaligned with their host star's rotation axis (i.e. highly inclined, and/or retrograde orbits), planet formation seems to be a frequent victim of planet-planet scattering and/or the Kozai mechanism. There may be a significant population of planets ejected from planetary systems roaming interstellar space.